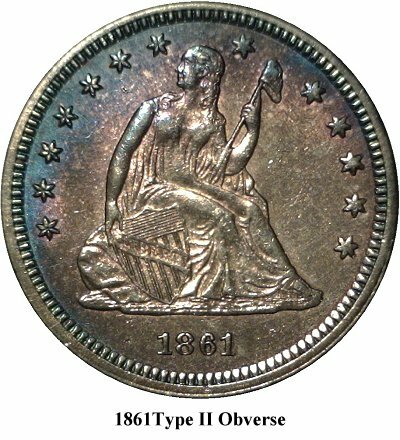 The past two months’ columns have focused on the transition from Type I to Type II Liberty Seated quarter dies during the 1859 – 1865 time period. 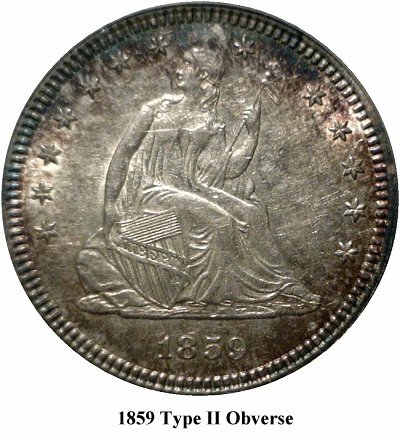 This month’s discussion will conclude that topic with a focus on the two rarest issues from the Philadelphia mint during that period; the first Type II/II quarter minted in 1859 and the last Philadelphia quarter to use the Type I reverse in 1861. The 1859 Type II/II is a rare coin that is seldom available. Since Heritage began archiving photos on their website a total of 74 business strike 1859 quarters have been offered for sale. The single Type II/II example among them was a cleaned F12 in a SEGS holder sold during 1999. Thirteen examples were reported in the 1993 LSCC survey and 7 were reported in 2007, out of a total of 57 and 51 examples of 1859 quarters that were reported in 1993 and 2007, respectively. Personally, in searching all the 1859 quarters I could find for over four years I have seen three examples of the Type II/II – one XF, one AU, and one MS62. I found 2 examples within 6 months during 2007 and then went more than three years before finding a third example. 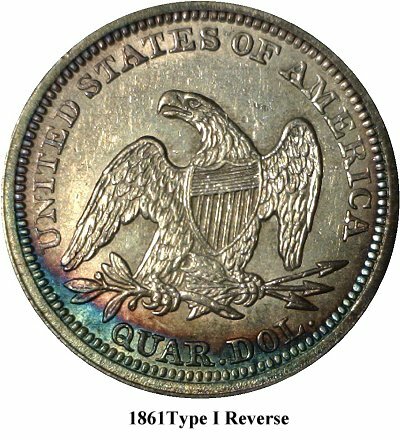 The 1861 Type II/I quarter is a very rare coin, which one noted expert has compared to the 1853 No Arrows in terms of overall rarity in all grades. It is even more interesting as a very rare variety of a very common date. Since Heritage began archiving photos on their website a total of 195 business strike 1861 quarters have been offered for sale. The single confirmed Type II/I example was sold in 1999 and resides in a SEGS XF40 holder. Seven of the 81 examples of the 1861 reported in the 1993 survey were Type II/I; five of the 57 examples reported in the 2007 survey were Type II/I. 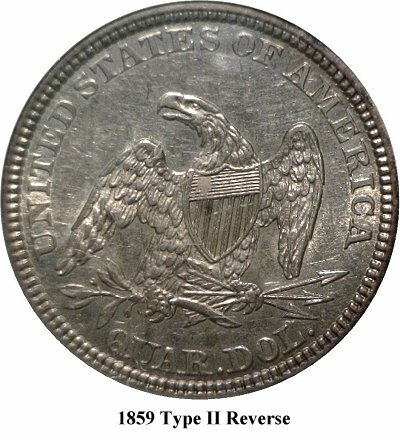 More than five years of diligent searching has led me to estimate that, contrary to what the survey numbers appear to indicate, the Type II/I represents less than one half of one percent of the 1861 quarters currently available in the marketplace. The search began with 18 months of futility, followed by one example each year for three years. Then, during early 2010, 5 examples appeared in the space of about 3 months, followed by 7 months (and counting) without a single additional example. The search has included EBay listings, several major shows per year, and more than a dozen dealer websites over a period covering more than 5 years. A total of 8 examples were located during that period. A particularly low number considering just how ubiquitous the 1861 is as a date.